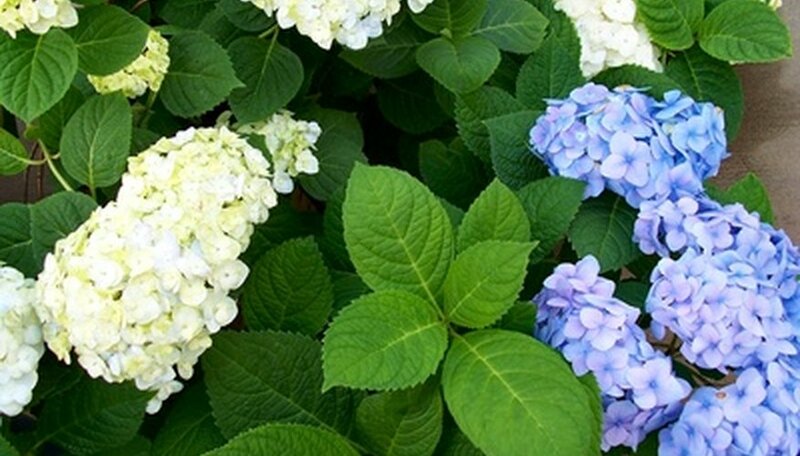 The look of hydrangeas in bloom is unmistakable to gardeners and non-gardeners alike. The large body and blooms of the hydrangeas make this plant both space-filling in landscaping and attractive during the growing season. To restore hydrangeas which have seen better days and have begun to produce smaller and fewer blooms, you’ll need to wait until the last frost has passed for your area and be ready to trim away old wood which is no longer productive. Sit next to the hydrangea and look for dead stems, also called canes, coming up from the base of the plant. Use the pruners to clip away the dead canes at ground level. Look over the plant to spot the oldest canes and clip only a third of them away at ground level, leaving behind old wood to produce flowers. This step should not be repeated annually, but carried out only when there is a large quantity of old stems. Clip off old, dry flowers that still remain on the canes by cutting behind the flower head just above the last pair of buds. Be careful to avoid cutting the buds themselves. Trim any canes which are misshapen by cutting them back to just above the first or second set of buds from the end of the cane. If there are any canes which are much taller than the rest these can be cut back to an appropriate height to match the other canes, but it may not bloom this year. Remove any brown or shriveled leaves which emerged too soon in the spring only to be damaged by late frost by cutting them off at their base. Once your plant has been restored, typical regular pruning should occur after the last frost and should consist of removing only the dead canes, clipping off dry flowers, and removing frostbitten leaves. If the hydrangea is extremely oversized, neglected, damaged and nonproductive, you can cut all canes back to 1 1/2 feet tall, replacing steps 2 through 4. This will prevent any blooms from occurring on this year's growth; however, the following year should produce blooms and healthy growth.